SoundTransit is a collaborative, online community dedicated to field recording and phonography. Phonography is the art of recording sounds from the environment around us, with an emphasis on the unintentional sounds which often go unnoticed in our daily lives. An international community of phonographers collect and share their recordings, with interests ranging from recordings of natural or urban environments to improvised situations or soundwalks, to the resonance of solid objects or the Earth’s atmosphere. In the BOOK section of this site, you can plan a sonic journey through various locations recorded around the world. In the SEARCH section, you can search the database for specific sounds by member artists from many different places. If you are a member of SoundTransit, you can also CONTRIBUTE your recordings for others to enjoy. The Creative Commons Attribution license encourages the sharing and reuse of all sounds on the website. 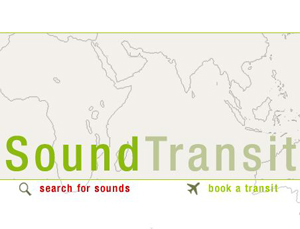 To listen to over 2,000 recordings by 471 artists from around the world, experience a unique way of traveling via sound, and to find out how you can contribute to the SoundTransit project, please visit http://turbulence.org/soundtransit/.